Is Germany Acting Like a Hedge Fund? In recent years, the German government has been very keen on attacking hedge funds. It all started in 2005 with Müntefering’s “locusts” diatribe, and the current Finance Minister Wolfgang Schaeuble has kept up the act, most recently by demanding that funds be placed “under surveillance” by intelligence agencies. Yet, observing German government behaviour over the last year, I cannot help but wonder whether, in their hedge fund obsession, maybe they have learnt some tricks of the trade. Where to start? First, among the activities of hedge funds that attract them so much public ire is accelerating a bond panic, say by short-selling sovereign debt, and then surreptitiously buying it back at vastly reduced prices, once the panic has run its course. 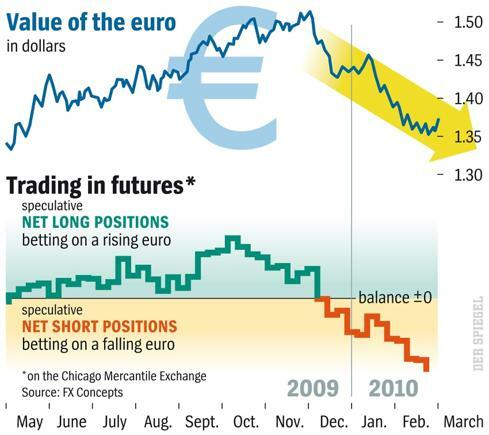 As data from the Chicago Mercantile Exchange shows, speculators went massively short the euro in January, and Greek debt in particular: yet by the end of summer, just as ordinary investors had sold out their positions in terror of an impending eurozone ‘collapse’, institutional investors had piled quietly back in. Whether by accident or design, Berlin has got a similar deal with its own eurozone crisis lending. In late 2009, as it became clear that Greece had falsified its accounts and would be in need of a bailout, the new government announced emergency cuts and canvassed support from potential lenders. After a slow-motion crash which saw bond yields spike 7 months later at 12 per cent, EU member states finally agreed a lending package that would allow Greece to borrow from other members at a reduced rate of 5 per cent. Yet many forget that in late 2009 , the yield on Greek 2-year bonds was still 4 per cent, and that the real loss of confidence only occurred in February when Germany blocked other eurozone states from finalising an EU ‘bailout’ mechanism and France blocked Greece from turning to the IMF. Had Greece been allowed to go straight to the Fund, the country could have borrowed at a 3 per cent SDR rate. EU member states, led by Germany and France, precipitated a crisis that has allowed them to force out of Greece a rate of return a good margin greater than what the country might have received elsewhere. This is the kind of trickery that would earn any hedge fund manager a very healthy end-of-year bonus. Likewise, there is also a strange parallel to be found in the financing of major investment banks, and Germany’s involvement in the new European Financial Stability Facility (EFSF). Perhaps one of the most subtle and odious practices since the financial crisis has been the way that banks have recapitalised by borrowing unlimited amounts from the ECB and the Federal Reserve, at interest rates you or I cannot access, and built back their balance sheets (as well as maintain their salary structure) by lending out at higher rates to companies and to governments (though in the eurozone, primarily to distressed governments). Strangely, via the EFSF Germany, along with its other contributors, looks set to profit from a similar kind of debt arbitrage. In order to pay for its contribution, the ESFS is expected to issue bonds at 3.5 per cent, and then lend the money to countries like Ireland at a final rate of 6 per cent; if Germany receives compensation equivalent to its €120bn guaranty, debt arbitrage will pocket Berlin an additional €4.4bn a year – a cumulative 400 euro windfall for every man, woman and child in Germany over the next ten years! And this the policy for which German voters are apparently outraged. Many of course remain under the sad delusion that Germany has actually given money to Ireland, rather than simply written insurance on a loan. I know the German government response would be that these loans will be very risky, and in the event that Ireland or Greece has to default, the German taxpayer that will foot this cost (though I calculate a huge haircut of around 25 per cent would be required for this ‘Bund-EFSF arbitrage’ to turn a loss). They also might say that issuing guarantees to Greece, Ireland and so on forces up the cost of their own debt refinancing, though the evidence is mixed so far. And I know that finally they might reply that if Germany and other eurozone governments did not step in, these countries would not find institutional investors for their loans, and could face a paralysing default. Even here I am not so certain, as in addition to the IMF, China’s two main sovereign wealth funds have about $700bn in total assets under management, the Russians have at least $150bn, the Abu Dhabi Investment Authority about $600bn, Saudi’s AMA has $431bn, and Libya has another $70bn lying spare. Some assortment of these countries might be prepared to bail out Europe’s little sovereign defaulters, if they agreed to rent out their foreign policy for a few years. So in exacerbating crises from which they subsequently profit, are Germany and France behaving like ‘hedge funds’? I, myself, am not cynical enough to believe that they would collude to extract a tough deal simply for their own benefit. But I am realist enough to know that, unless concessions are offered further down the line, many voters in Dublin and Athens will start to see it that way.